Astana’s ProTour license review drags on. Approval by insult? 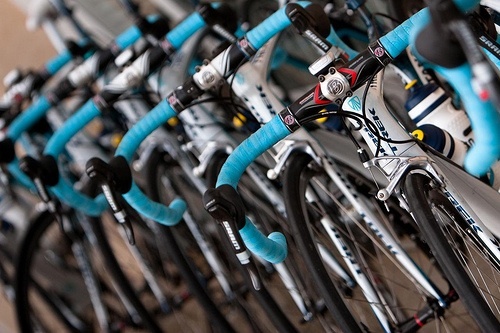 Team Astana: plenty of bikes, no license. As the glacial pace of the UCI’s review of the Astana ProTour license continues, the Kazakh Cycling Federation employed a novel approach to gaining approval: insults. “It seems to me that they don’t want an Asian team in the ProTour, and for it to beat European teams,” Federation president Nikolai Proskurin alleged. The world shakes its head in amusement — the guy is actually playing the racism card. That’s brilliant. Then the angry Proskurian shifted gears, moving from insults to conspiracy allegations, claiming former Director Sportif Johan Bruyneel is trying to scuttle the approval. “Bruyneel told us that he would do everything possible to ensure that they withdrew our license,” Proskurin stated. This is a perfect reminder that the UCI considers the Astana management a bunch of bozos. Then the federation head slid into some generic whining, claiming it would be difficult to satisfy the additional financial requirements. Proskurin argued that there is already a significant bank guarantee in place. “A guarantee from Samruk-Kazyna is much more important, because it has the stamp of approval of the government itself.” Everyone knows how stable the Kazak government is, right? All this leading to the question, is this a smart approach to getting your ProTour license re-approved? The antagonism, insults, bullying, disparaging remarks and whining might work in the homeland but the UCI is based in Switzerland. They appreciate sophistication and manners and keeping the dirty laundry in the basement. Does Mr. Proskurin think that approach will earn Astana extra points on a close decision? Back in the day, loud, obnoxious Americans used to go to Europe on vacation, yelling and flashing their big fat wallets. Those days are long gone, replaced now by the ugly rich Russians on holiday. Twisted Spoke thinks the Kazaks are taking the same approach. It doesn’t win many friends. « Beppu the wheelie man confirms Radio shack signing.